Paul Cook has called on Wigan Athletic to rediscover their ‘real identity’ ahead of the 20-game mini-league that will decided their destiny. Latics have 26 points from their 26 matches played, and currently stand four points above the dreaded drop zone in the Championship. A run of only one win from the last 14 matches has seen them slip down the table after a fine start that saw them lying third at the end of September. That was before injuries bit into a small squad but, as players start to return from long lay-offs, Cook is confident that will sort itself out. 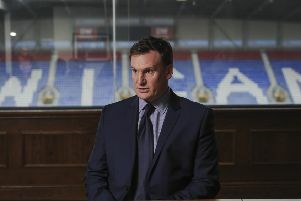 “I try and be as honest as I can, but sometimes football matches just come down to personnel,” the Latics boss said. “And if you don’t have that personnel, everything else - formation, tactics, etc – can go right out of the window. “We played quite well at West Brom on Boxing Day, but we were undone by a £20million striker (Jay Rodriguez) who scored two goals. “Sometimes you just have to hold up your hands and acknowledge you’re not quite good enough to compete with that. “But by the time we get all of our best players fit and available, I’d like to think we’ll give a much better showing of our identity. “Our identity was shown over the first 10 games or so of the season. “Our identity has been a little bit lost in the last 10 games. Cook’s options were further boosted this week by the addition of Anthony Pilkington from Premier League Cardiff City, the forward penning an 18-month contract at the DW Stadium. But Cook is remaining tight-lipped about whether he will be the first of many this month – the first transfer window under new owners International Entertainment Corporation. “I’m genuinely not getting involved in transfer talking – for good, for bad, for ugly,” he added. “January is a notoriously difficult window for football clubs in general. “Can you always get the players you need and want in January? That’s open to debate. “All I can do is concentrate on the players who are fit and available to play this weekend. “And for the first time in quite a while, we will have a problem selecting a bench. Cook has been strongly linked with Reading defender Tyler Blackett – who can play left-back and centre-back – but has so far received no joy.